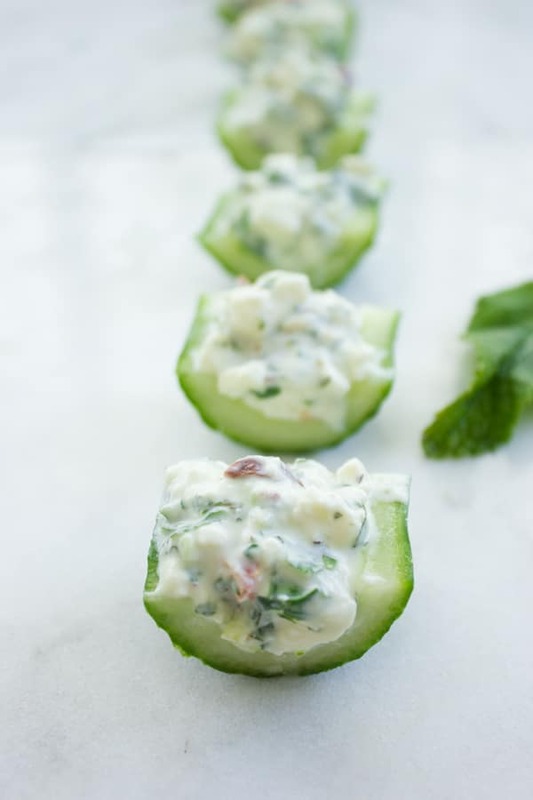 These Feta Cucumber Salad Bites are a cross between your favorite feta cucumber salad and crunchy cucumber bites. The perfect last-minute bite-size appetizer for those summer BBQ parties coming up. I’m one of those people going super light on my meals right now. No more sauces, no more heavy pasta and no desserts! But maybe just a little bread and pizza. 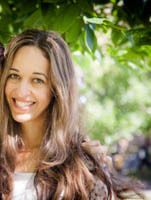 Most of all I feel I’m all for cleaner, healthier foods, and all for the BBQ fun! Be prepared to see quite a lot of light and healthy recipes for salads, slaws, fruity desserts, ice cream, and all things BBQ! 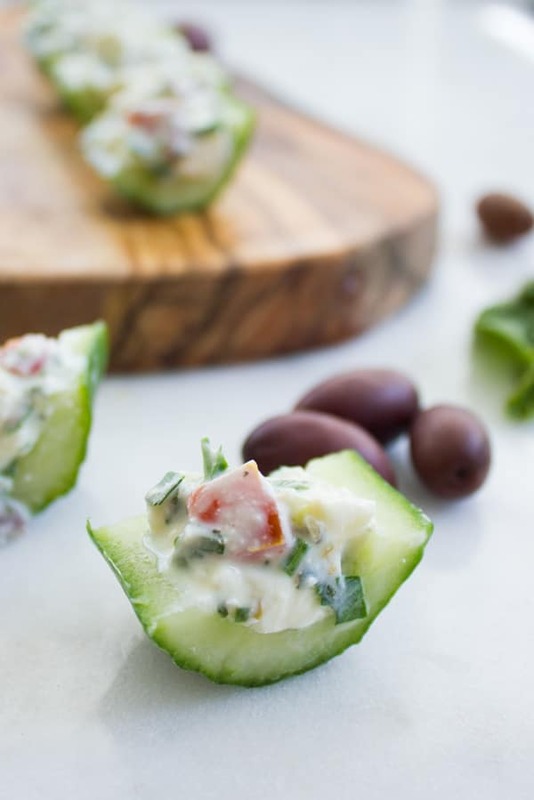 On this journey to healthier eating, this recipe for Feta Cucumber Salad Bites is already a favourite. 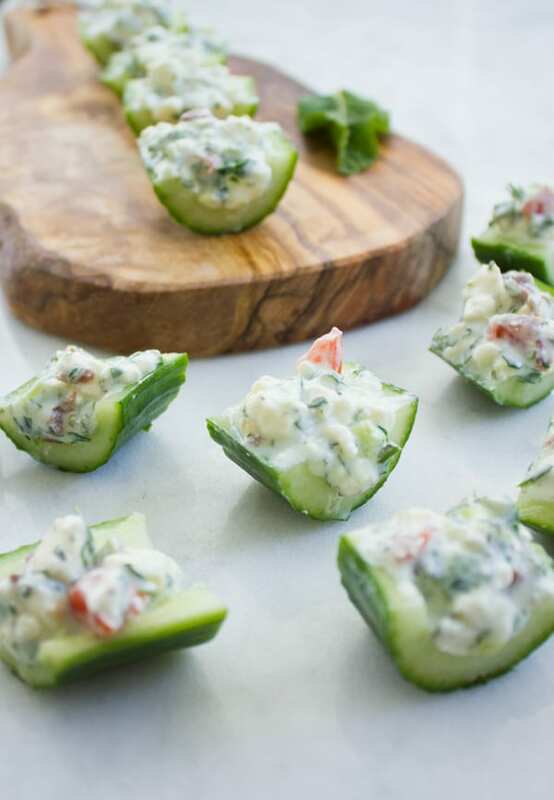 These Feta Cucumber Salad Bites are the perfect last-minute bite-size appetizer for those summer BBQ parties coming up. 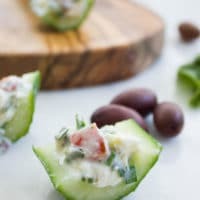 Think of them as a cross between your favorite feta cucumber salad and crunchy cucumber bites. These healthy bite-sized cucumber snacks taste so fresh. Slightly tangy and salty, and at the same time spicy and zesty with the perfect crunch from the fresh cucumber! Just a burst of sunshine in every bite. Do you remember I made those delicious Mini Zesty Feta Stuffed Peppers a few months ago? At that time I made them for the Big Game and I broiled them slightly to get a nice char on them, but they would be even better on the grill! I’ve used the same zesty feta filling, so once you make that fresh tasting feta filling, use it for both recipes! The feta, paired with fresh herbs, olives and chilli is a perfect match for these Feta Cucumber Salad Bites. While I’ve made the filling using my favorite spices, you can totally play around with the ingredients! 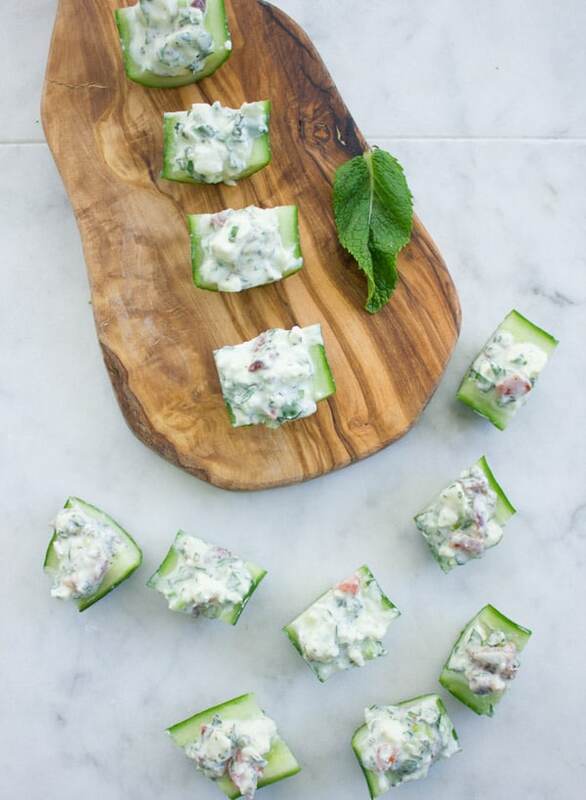 These Feta Cucumber Salad Bites come together very easily! Take a large cucumber and split it in half lengthwise. You’ll then scoop out the seeds using a spoon. You cucumber will now look like a boat. 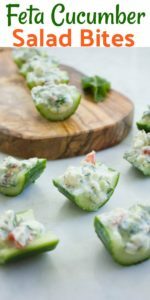 The filling for these cucumber salad bites is so easy to whip up. Just stir together some feta cheese, garlic, sour cream, herbs, chilli, chopped olives, lemon, scallions, olive oil and Zaatar spice blend. You can find the recipe for the filling in my post for these Feta Stuffed Peppers! 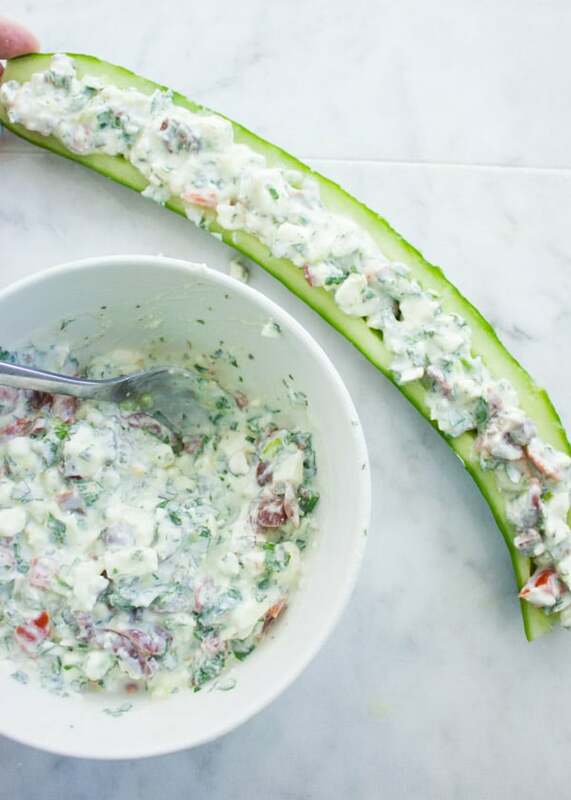 Once you scoop the filling inside, you’ll simply cut up the cucumber salad into bite-sized pieces, about an inch wide. Now you’ll be gobbling them up one after the other like I did while taking the photos. Fire up your grill, and munch on those cucumber salad bites while you wait for your food to be ready. I am sure you will enjoy this healthy bite-size appetizer! Use a serrated knife to cut the cucumber into bite-sized pieces. Feel free to add your favourite spices to the feta cream. 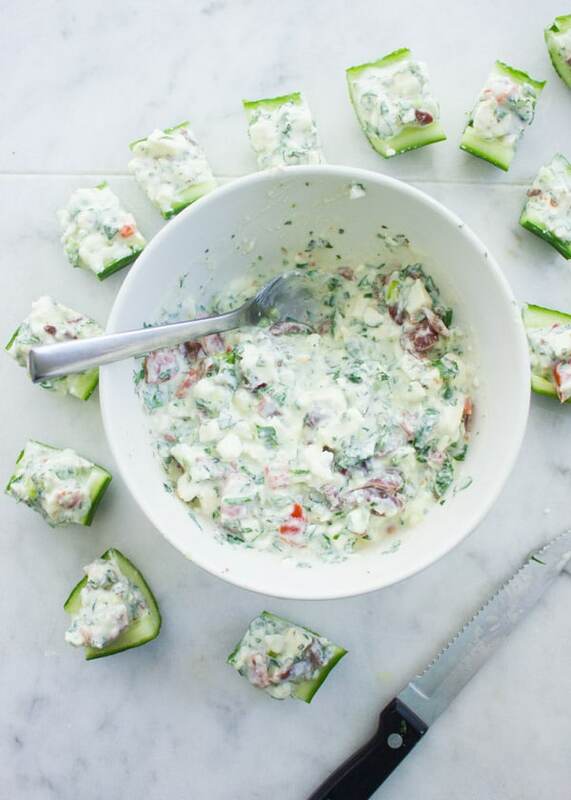 If not serving immediately, chill your Feta Cucumber Salad Bites in the fridge. 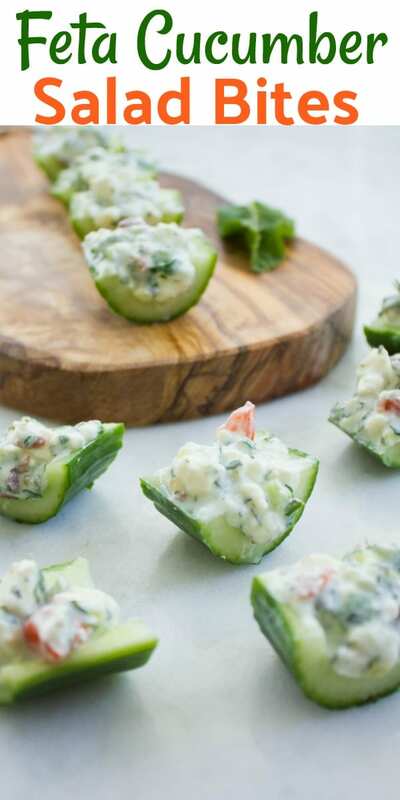 These Feta Cucumber Salad Bites are a cross between your favourite feta cucumber salad and crunchy cucumber bites. The healthy bite-sized snacks are the perfect last-minute appetizer for those summer BBQ parties coming up. Make the feta filling using this recipe! Slice the cucumber open lengthwise. Take a small spoon and scoop out the seeds of the cucumber while creating a small dent along the length of it. It will look like a boat. 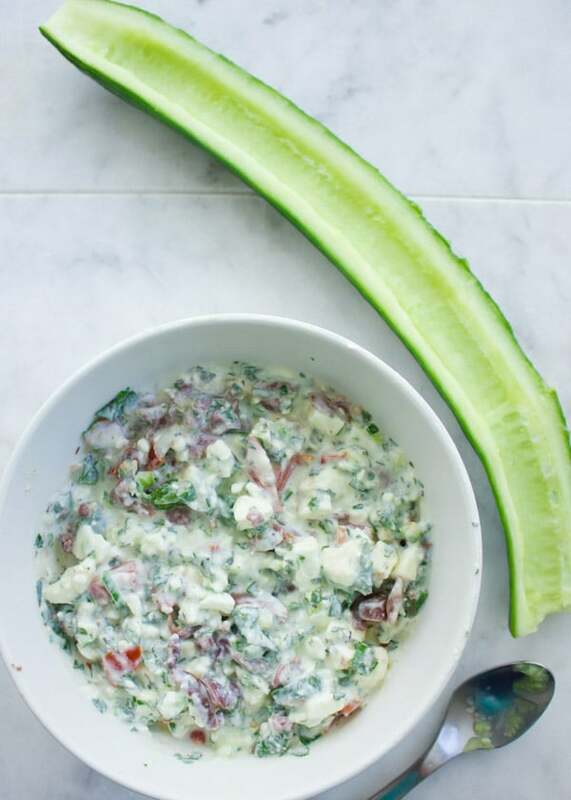 Using a small spoon, fill the cucumber boat with you feta cream, making sure to press down the mixture as you go. With a small serrated knife, cut off 1-inch wide (bite-sized) pieces of the filled cucumber and serve right away. Thanks Vivian, hope you enjoy them!